Doing the right thing isn't easy sometimes - but when it comes to helping an animal whose life is at stake, the reward in the end is always well worth the effort. For the last week or so, folks frequenting the local Cultural Center in Araras, Brazil, had been puzzled to hear the crying sound of kittens emanating from the ground outside. Though the exact source wasn't clear, they tried alerting officials that animals may be trapped, but were told to turn a blind eye. "Unfortunately, some people wanted to leave the kittens die there," one of those involved, Ricardo Urbach, told The Dodo. 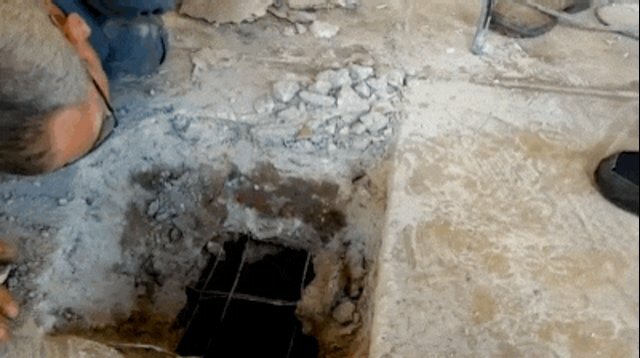 Instead of ignoring it, however, they started digging. With the help of authorities sympathetic to the situation, including workers from a utility company, the rescue was underway. 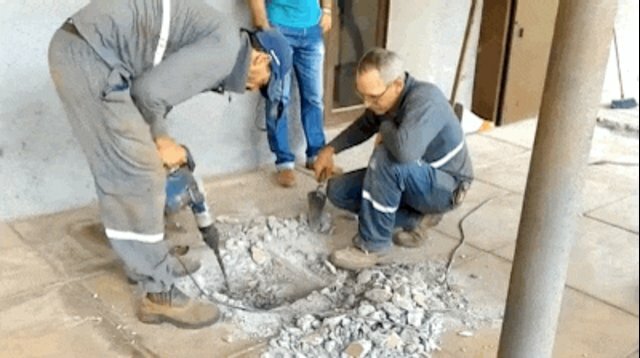 Using a jackhammer, they began to tear up the concrete, careful to avoid injuring the creatures stuck beneath. It is believed that the kittens had been born on the roof of the building, only to wind up falling into the rain gutter's drainage pipe. Since the rescuers didn't know precisely where that pipe lay, it was a matter of trial and error to find it. Fortunately, their hard work and persistence paid off. Eventually, after the first hole came up short, the rescuers hit the mark. Inside the pipe they found four tiny kittens, amazingly still alive and kicking despite their long ordeal. They had done it - saved the lives of helpless animals who some others thought were not worth the effort. "Thanks to everyone who helped!!!" rescuer Guillya Nahirniak wrote on Facebook. "Thanks so much!" Here's footage of the rescue in its entirety, though there's more to this happy story yet. 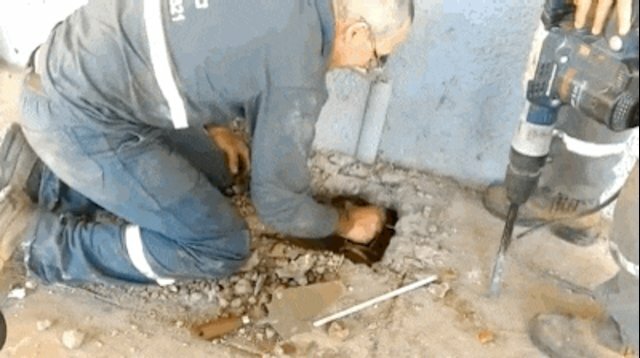 The group's efforts didn't stop with just saving the trapped kittens. Now, they're making sure they have the best shot at a happy life as well - and they're not the only ones. "Since we announced the rescue of the kittens on social media, people in the area have donated milk, bottles, medicine and pet products," said Urbach. "Today, they were treated by a veterinarian here in the city. They will be rehabilitated, then put up for adoption."